Panasonic was on a mission to deliver technology innovations for a better world at Chillventa 2018, Nuremburg. Celebrating 60 years of heating and cooling expertise, Panasonic turned the focus to more environmentally-friendly solutions to deliver highly efficient HVAC+R in the commercial and residential markets. On day one, Panasonic hosted a press conference attended by journalists and VIP’s from across Europe. 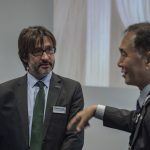 Three VIP speakers from Panasonic discussed the latest developments to support its growing presence in the European market. Mr Masaki Arizona, Director of Global Sales, shared news about Panasonic’s new HVAC manufacturing line which recently opened in the Czech Republic. The new facility will shorten lead times for customers in Europe and reduce the environmental impact of long-haul product transportation. Gaining its place in the refrigeration world, the spotlight was on Panasonic’s latest cold chain solution, the CO2 VF Series. This product range takes advantage of the natural occurring gas CO2 to provide retail and commercial markets with an exciting, more sustainable option for cold storage rooms. Mr Shigaro Dohno, Managing Officer Food Retail & Commercial Equipment Business, outlined Panasonic’s environmental vision for 2050 in Europe with CO2 solutions playing a key role. Mr Dohno highlighted the fact that Panasonic is already the No. 1 market leader for commercial refrigeration in both Japan and China. With 50 years’ experience within the commercial refrigeration market under its belt, Panasonic will draw on previous success to help achieve its goals in Europe. Working closely with retail partners across Asia, Panasonic has developed CO2 solutions that help to reduce F-Gas global warming impact, offering up to 25% energy savings for freezing and up to 16.2% energy saving for refrigeration. Since 2017, there are now hundreds of projects installed with Panasonic CO2 units across Europe. 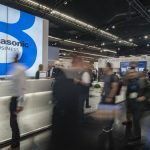 In Hall 4, the Panasonic booth showcased key innovations including the new CO2 condensing units and highly efficient Panasonic Hybrid GHP/VRF, which intelligently combines gas driven (GHP) and electric (EHP) technologies within one solution. Hybrid VRF is an ideal solution for high demand applications, such as hotels, apartment blocks and offices. Visitors to the Panasonic booth also experienced another exciting innovation in the form of a Formula E car simulator. As sponsors of Formula E racing, Panasonic entertained guests with a realistic race simulator that took them on a virtual ride around a Formula E track. Encompassing high energy, high power and performance, the simulator was perfectly in sync with the new innovations from Panasonic. Chillventa 2018 was a celebration of Panasonic’s commitment and dedication to developing technology which delivers excellence in sustainability, energy efficiency and performance. For more information, please visit www.aircon.panasonic.eu.